This month, I tried a cookie idea from the October issue of Martha Stewart Living, making these cute and playful Dia de los Muertos cookies with the small Bears (click the link to see a post about them on Martha's website). Dia de los Muertos, or Day of the Dead, is a holiday celebrated throughout Mexico, on November 1 and 2, to honor the deceased. I've always been drawn to its traditions, such as the creation of sugar skulls, which are delicate skull shapes made of sugar and decorated with candy flowers and other designs. Martha's cookies are meant to mimic this style, using icing, candies and baking decors to create interesting designs. Our cookies are somewhat less precise than Martha's, but we had a lot of fun making them. Martha suggested a recipe from her website for the cookie dough, a chocolate-cinnamon one. This sounded really tasty to me, but I wasn't sure how the rest of the family would feel about it. (Probably just fine, I've realized in hindsight, but I would never want to stand in the way of cookie-devouring). I decided to use my old faithful sugar cookie recipe, from the Betty Crocker cookbook. I know it well; it tastes good and it always works. We mixed up our dough and left it in the fridge for a couple of hours as directed. Martha wanted me to bend an oval-shaped metal cookie cutter at one end to create a narrow face shape. I don't have any cookie cutters like that, and I'd balk at altering one if I did, so I had some help from the Bear in the form of a 3-D printed skull-shaped cookie cutter. He jumped at the opportunity to use his 3-D printer to make a special item for me. He designed the shape himself and it printed up nicely. My lovely Bear. I was right. The side bits didn't come through well in the baking, but the cookies still looked skull-like. He plans to make a new cutter without the side pieces; I'm ambivalent but I'll take any custom cookie cutters he feels like producing. It's just too cool to pass up. I put the cookies on a sheet pan with sides to help contain messiness, and we got to work. I made icing from powdered sugar and milk, put it in a bag with one corner cut off as a piping tip, and iced the cookies one at a time. I couldn't do more than that because the icing dried so quickly, but it was a quick and easy job. I piped around the outline of the cookie, then did some squiggly lines across inside the outline, then used a spoon to spread it all around. I'm not especially good at icing but I enjoy doing it, so I liked this part. The small Bears and I raided my big bag of baking decors, coming up with sugar flowers in two sizes, blue gel icing, and chocolate and colored sprinkles. For noses we decided on Red Hots, which are small disc-shaped cinnamon candies. The eyes are chocolate chips. Martha's skulls were a little fancier, but I think we found a good assortment of things to use. I considered getting out some tools - hemostats, tweezers, etc. - for decor-placement, but in the end I let them use their fingers and I did too. I really loved how they turned out. The cookies were delicious and they were so festive and fun to make. My kids were so proud of them! I had them on a pan in the dining room to finish drying and they dragged the Bear to see it as soon as he walked in from work. I liked that we all had a part in making them; it's the best kind of creative adventure. Here in New Mexico, we are fortunate to enjoy beautiful blue skies almost all the time, with 300 sunny days per year. I show you our sky pretty often; I'm a sky-watcher and I love to share what I see. 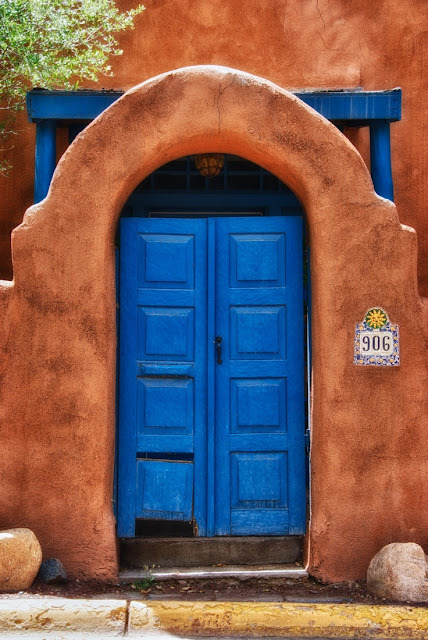 There are other beautiful blue sights to see in our state, part of a proud cultural and architectural tradition that I enjoy just as much - the brilliant blue-painted doors and wood trim on many New Mexican homes (including my own). 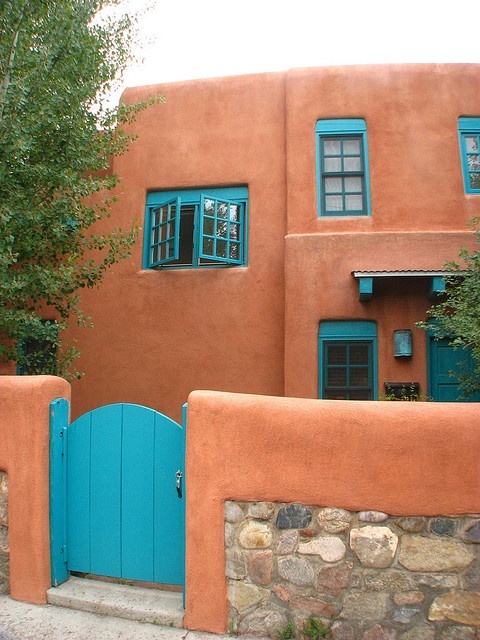 This is often referred to as Santa Fe style, or Taos style, but it can be seen all over the state. Doors, window trim, flower boxes, vigas and canales might be painted in some shade of blue, standing out against the earthier tones of the stucco that covers most homes here. The stucco blends into the high-desert landscape; the blue shines boldly. Why blue? There are numerous schools of thought on this subject. Some say that the color blue wards off evil spirits, keeping them from entering one's home. This tradition probably began with the early Spanish settlers. Or maybe the color is connected with Our Lady of Guadalupe, who appeared to Juan Diego, a Native American peasant, in 16th-century Mexico City. Also known as the Virgin Mary, Our Lady of Guadalupe is associated with sky blue, the color of the robes she wears. The tradition might also be traced to the beliefs of Pueblo Indians, for whom colors are indicative of directions, with blue symbolizing southwest. Still others cite the blue doors on the Palace of the Governors in Santa Fe, a compound built in the 1600's as the seat of Spain's colonial government, as a source of inspiration. And then there are the theories about spirituality and connections to heaven. Nobody seems to know exactly why blue doors are such an important tradition here. There are as many reasons for blue doors in New Mexico as there are blue doors, I think. Today, we see blue doors as a sign of welcome, a symbol of peace and tranquility within, an extension of goodwill to those entering. I like this theory best; it's why I've kept blue on the exterior of my home, a shade somewhere between slate and royal. My doors are not blue (they're carved natural wood, too pretty to paint), but the wood trim on my home is blue, and I decorate the yard with blue pottery and blue glass marbles in the xeriscaping gravel. I love the tradition and I'm proud to celebrate it. The most interesting part of this tradition is the variety - there is no set shade of blue to use. 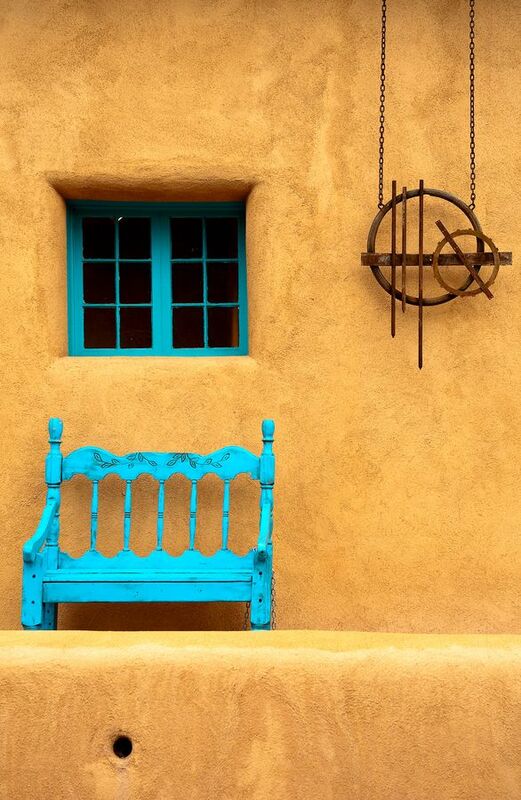 Walk the Canyon Road in Santa Fe, or stroll the Plaza in Taos, and you'll see many brilliant shades of blue on houses, shops and galleries, ranging from palest aqua and soft powder blue to bright turquoise, clear azure and deep indigo. Set against earth-toned stucco and stone, the windows, doors, courtyard gates and other architectural features really pop. But they're a calming influence too, signifying protection and peace, welcoming visitors, drawing them in. Blue doors, with all their mysterious and much-debated origins, are one of the best things about my beautiful state. This is a diverse place, one of the oldest in the Americas, with deep and varied cultural roots. 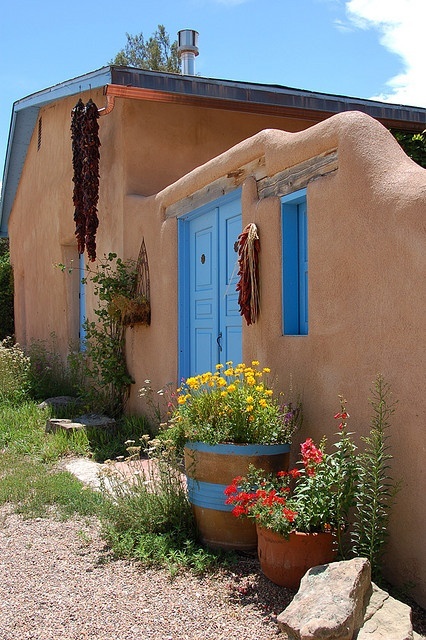 The unique tradition of blue doors is one that ties together some of the most important parts of our heritage - the beliefs of ancient native peoples, the influence of Spanish colonial rule, and our collective relationship with the endless sky. Have you ever wondered what I'm talking about when I mention the "swamp cooler"? I have offered a link to read now and then (here it is again, if you're interested). That's our swamp cooler in the photo above. It sits permanently on our home's flat rooftop. The swamp cooler is our home's cooling system. It's an integral part of our lives between May and October each year. Earlier this summer, the Bear had to do some work on the swamp cooler and I asked him to take a few photos for me. I know you're simply dying to learn more about this contraption. Close your browser window now if you came for coziness; today we're talking machinery! Ha. Our swamp cooler is a MasterCool* which is considered a very good brand. (It came with the house). "Swamp cooler" is a colloquial term; the formal term is "evaporative cooler," but people call it a swamp cooler because it can make your house sort of...swampy. To work well, it depends on the driest of air. On dry days, it works beautifully, but on wet days, it's pretty much useless. Monsoon season happens to also be swamp cooler season; you can imagine how effective these coolers are when it rains all afternoon and evening. But generally, it's very dry here and they work great. I'm not a swamp cooler salesperson, just a happy user-owner! I'm not a swamp cooler mechanic either, so I can't offer really good technical discussion. I can tell you the basics, though: there's a pump that sprays water (from the regular household plumbing system) onto a cardboard-like mat. At the same time, a fan blows air across the wet mat. The air is cooled by this process. The cooled air travels through the duct-work and blows into the house. Some people prefer regular air conditioning, and we probably would too, but the swamp cooler is much less expensive to operate. Swamp coolers are ubiquitous in the southwest because they do generally work well in this climate. I happen to like the moisture it puts into the household air; it can be so dry here that I have minor nosebleeds sometimes, and my skin is always dry and flaky. The slight dampness in the house feels good to me. I like the sound of the air through the vents too; it's a gentle whooshing sound in the house day and night (once the cooler comes on, it tends to stay on until late evening). One negative is that the swamp cooler can't really be programmed with a thermostat and it is limited in how cool it can make the house. We set the controller (inside the house, near the furnace thermostat) for the indoor temperature we want the cooler to come on (usually 74 degrees) and we can expect the indoor temperature to stay at about 15-20 degrees cooler than the outdoor temperature, though that depends on the dryness of the outdoor air. It can't cool wet air, though it will often continue running during a rainstorm, which makes the air in the house humid. Sometimes papers and fabrics will feel damp (especially bedsheets, and oh, how I hate a limp bedsheet...yuck). Dry foods need to be sealed well or they'll get slightly dampened too. Also, in order for the swamp cooler to work effectively, you have to keep a few windows cracked open when it runs. Then, you basically have wind blowing through the house, out through the vents into the rooms and out of the house through the windows. This keeps the air moving and helps the house cool. But it can be a bit windy indoors, which isn't always welcome. This is a water reservoir inside the cooler. It has a floating valve, just like a toilet. Actually, the entire mechanism is a little like a toilet. A very cool toilet, hee hee. Here is the back of the swamp cooler, where the air intake occurs. This is the cardboard thing I mentioned earlier; we have to replace it every few years for good performance. There is other maintenance too; the cardboard can become moldy and can also develop mineralization from the water unless you "bleed" the water mechanisms periodically. The Bear does all of this himself in the spring and fall each year (I don't get up on the roof, thank you very much). I had been meaning to share some tidbits about the swamp cooler for a while and was inspired by his recent ascent to the roof to shut down the cooler for winter. He disconnects the power to the swamp cooler and also disables the water and closes the vent that lets cool air into the house; if we left it open, the hot air produced by the furnace would escape. It's a bit of work to keep it all working well, but after seven summers in this house, he's a swamp cooler aficionado (well, for this swamp cooler, anyway). So there you go, a glimpse into our HVAC life. I really should get up on the roof sometime...just look at the view!